Magnificence washcloths in natural linen. 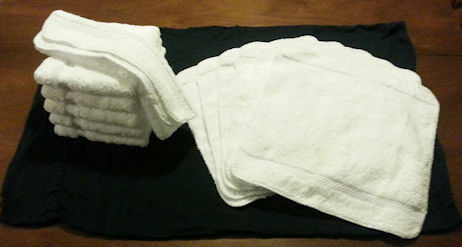 6 pack of luxurious and super popular Magnificence washcloths (W555) From 1888 Mills in Griffin, GA. This is the last American made towel line! And they can be yours. Washcloths are 100% Pima Cotton Loops w/ American grown cotton and they feature a dobby border. Available in 2 colors: Natural Linen and White. Size=(13" x 13"). Great for master bath and guest baths/ powder rooms as well. 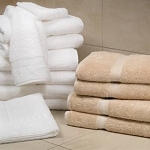 We have been using our Elite set for over 3 years and they are still very plush, absorbent and good looking. They hold up extremely well. DISCOUNTS AVAILABLE FOR MULTIPLE 6 PACKS IF YOU WANT TO STOCK UP.